Prison cells, masks and Frontier in Space (1973) | Randomwhoness: a Doctor Who blog by Johnny Spandrell. Sampling stories in random order. There’s an embarrassment of riches when choosing topics about Frontier in Space, but let’s start here: prison cells. They’re a common enough feature of Doctor Who and they provide handy settings for narrative functions such as plot exposition and character development. They also mean either exciting escape attempts or bust outs are just around the corner. They can pad out an under running script. And best of all, they’re cheap. Frontier must win some prize as the story with the most scenes set in prison cells. The Doctor (Jon Pertwee, deep in his tenure in the role, cloak flapping, white hair radiating like a halo) and plucky assistant Jo Grant (Katy Manning) spend most of the first four episodes going from cell to cell. The Doctor even takes a trip to the moon to visit one. Episode Five is surprisingly incarceration free. But a few minutes into Episode Six, the Master (Roger Delgado) purrs, ‘Show Miss Grant to her room’, which is of course, another cell. Phew! I felt dangerously liberated there for a moment. Delgado is making his last appearance in the program, and he’s on form here, all charming and inveigling. The scene where he convinces the lunar prison’s governor to hand over the Doctor is a particular delight; in it, the Master starts by seemingly flattering the Governor but slyly moves the conversation to show that he’s deduced that the Governor’s up to no good and is prepared to blackmail him. Delgado pitches this scene just right, silky and debonair, but always in control. But actually, he’s not always like that. In fact, this is Delgado’s fruitiest performance in the role, a long way from the understated menace we normally attribute to him. It’s 80’s Master Anthony Ainley who’s usually accused of chewing the scenery, but here Delgado gives him a run for his money; there’s hardly a line he doesn’t milk for its full theatrical effect. It seems to me that this is a reaction to the general flamboyance on display around him. Big costumes, big design and of course, the big Doctor. The Master is always, in no small part, a reaction to the Doctor and Pertwee’s Doctor is overtly attention seeking. He doesn’t so much enter a scene as land in it, big, bold and bouffant, ready for confrontation. How else to play his nemesis, but to match him for bravura? The result is that Delgado’s performance seems subtle in comparison, but is actually painted in the broadest of brushstrokes. Finally, let’s talk masks. The Draconians’ half masks (designed by John Friedlander) which allow the actors more facial expression than your normal monstery types is rightly famous among Whoheads. But while the design and the freedom it allows is new (unless we count the Menoptera? And hang on, maybe the Ogrons too? They make a return grunty appearance here) the Draconians themselves are equally innovative. They’re aliens who aren’t villians, and it’s surprising that up to this point that’s rare in Doctor Who. But back to those masks, which are a gift to writer Malcolm Hulke, famous for creative morally ambiguous characters both with and without scales. Because it’s pretty hard to give a nuanced performance when no one can see your face, and Frontier requires its reptilian protagonists to be more than just (to borrow Gary Gillatt’s phrase) squabbling rubber. Hulke came across this problem in his first solo Who, The Silurians, where the “monsters” of the piece (reptiles again. Someone had a phobia), wore full head masks, completely obscuring the actors’ faces. There was an old, sympathetic Silurian and a young, headstrong one, and any debate between them relied strongly on body language (the yound one had an angry head bobble, if I remember rightly, the old one an elderly stoop) and voice acting to portray any difference between the two. It’s a problem the Draconians avoid. In Episode Two there’s a scene, where the Draconians retreat to their embassy after a contretemps with the Earthmen (although one is a woman) and two of them have a highly coded discussion about what next steps to take. It’s startling for Doctor Who; usually when aliens have scenes all to their own, they use them to discuss their nefarious plans and spit threats to camera. But here, something much more subtle is going on: “I must not detain you,” the Draconian Prince (Peter Birrell) hisses towards the end of the scene at an underling. “No doubt you have duties to attend to”. What he’s really saying is “go and rescue the Doctor and Jo” (they’re in a prison cell, natch), but his meaning is clear, helped in no small part because we can see his face. So those Draconians are game changers and Doctor Who‘s producers realised they were onto a good thing. From here on in designs which merged face and mask became more common and gave us some really memorable grotesques: the Sontarans, the Zygons, Davros. 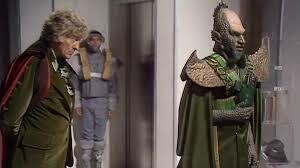 And it’s something the new series is still doing today; look at those 21st Century Silurians, where make up has supplanted the mask because we need to see the actor’s face. No need for an exaggerated head bobble now, so thanks Frontier in Space. LINKS to The Curse of Fenric: The Russians, seen literally in Fenric, are present as Draconians here, albeit ones dressed in the trappings of Japanese Samurai. NEXT TIME: Blimey, get a girlfriend Jeff! It’s The Eleventh Hour.